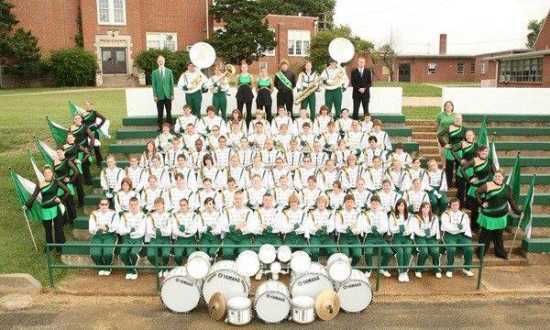 On Saturday, October 10, the Perryville High School Marching Buccaneers competed in a marching competition hosted by Charleston High School in Charleston, Missouri. The Marching Buccaneers came home Saturday night with nine trophies, including first place trophies in the parade competition and in the field show competition. In the parade competition, the Buccaneers won four out of a possible five captions, including "Outstanding Flags," "Outstanding Percussion," "Outstanding Music," and "Outstanding Drum Majors." They also won first place in their division, as well as scoring first place overall. In the field show competition, the Buccaneers won three out of a possible five captions, including "Outstanding Field Command," "Outstanding Percussion," and "Outstanding Music." They also won first place in their division, as well as scoring second place overall. The band is under the direction of Jay Peters and Eric Seible and the flags are under the direction of Mrs. Michael-Ann Buchheit.